Forest Stewardship Council(FSC) is very important for forestry companies who are supplying logs to customers who require independent certification that their wood products are sourced from well-managed sustainable forests. FSC has banned the use of some chemicals used for weed control in forestry and wish to see an overall reduction of chemical use. Forestry companies with FSC certification, including PF Olsen , have been working closely with FFR to address concerns relating to herbicide use. Two key reports have been prepared to provide a scientific basis for the ongoing judicious use of chemicals that FSC wish to restrict. The first evaluates chemical and non-chemical means of vegetation management and compares the economic effectiveness of the alternative control methods. Non-chemical controls were found to have a significant negative impact on the economics of plantation forestry. The second report evaluates the leaching risk of Terbuthalyzine, a herbicide commonly used to control forestry weeds. The work shows that the risk of leaching of this chemical is low under forest soil conditions, due to the high levels of organic carbon in the soils. This work has been favourably received by FSC and as part of an ongoing programme of research, it is hoped that it will contribute to continued, safe use of cost-effective herbicides by forest owners. Standing for Light Detection and Ranging, LiDAR was originally developed for military purposes and adopted for commercial use in mining, civil construction and environmental areas some 20 years ago. It is now in use in the forestry industry. FFR has been researching the use of LiDAR in forestry and sees potential for far greater use of this technology to add value to forest owners in NZ. In conjunction with Waiariki Institute of Technology in Rotorua, a two day workshop is being organised on 22–23 September to provide a hands-on demonstration of the application of this technology and importantly to discuss what is needed to get wider uptake and use of LiDAR. For details on the workshop go to www.ffr.co.nz/lidar-workshop-22-23-september-2010-rotorua. 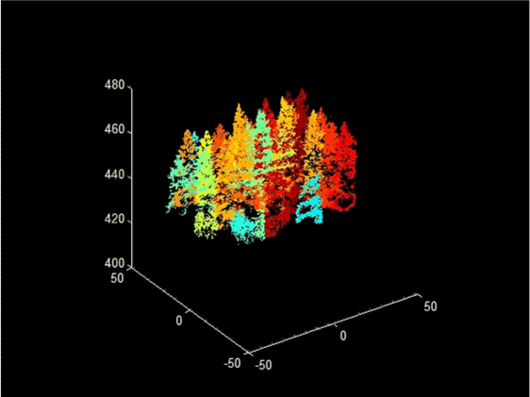 The main forestry applications for LiDAR are improvements in harvest planning and timber inventory. Photo showing LiDAR image of a forest canopy spanning a stream gully.